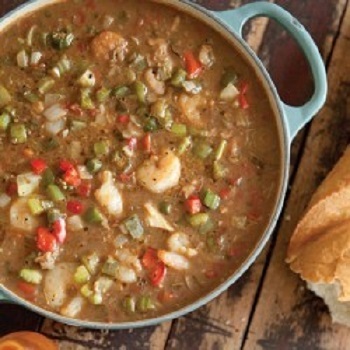 This traditional Louisiana gumbo packed with seafood, and bursting with flavor. Serve this over rice and you have a feast. Add onion, bell pepper, celery, garlic, and okra. Cook vegetables, stirring often, for 5 minutes. Add beer, stock, file powder, bay leaves, Cajun seasoning, crab claw meat, Worcestershire, salt, and cayenne. Bring mixture to a boil; reduce heat to medium, and simmer for about 1 hour.